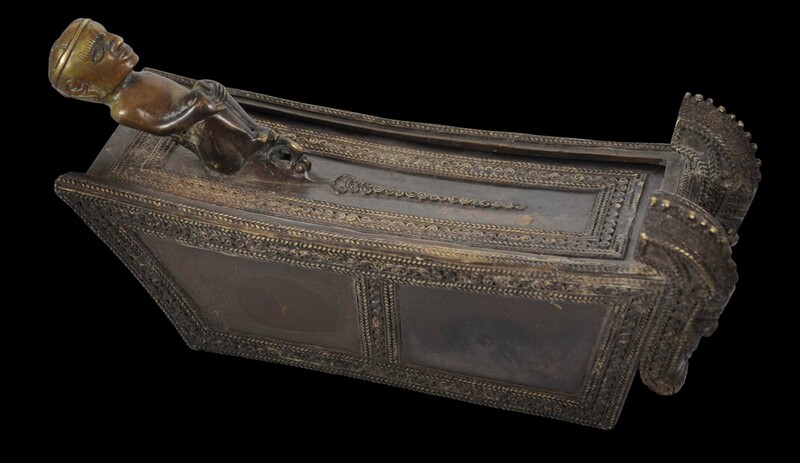 This rare box or casket cast from brass is from the Batak people of north Sumatra. 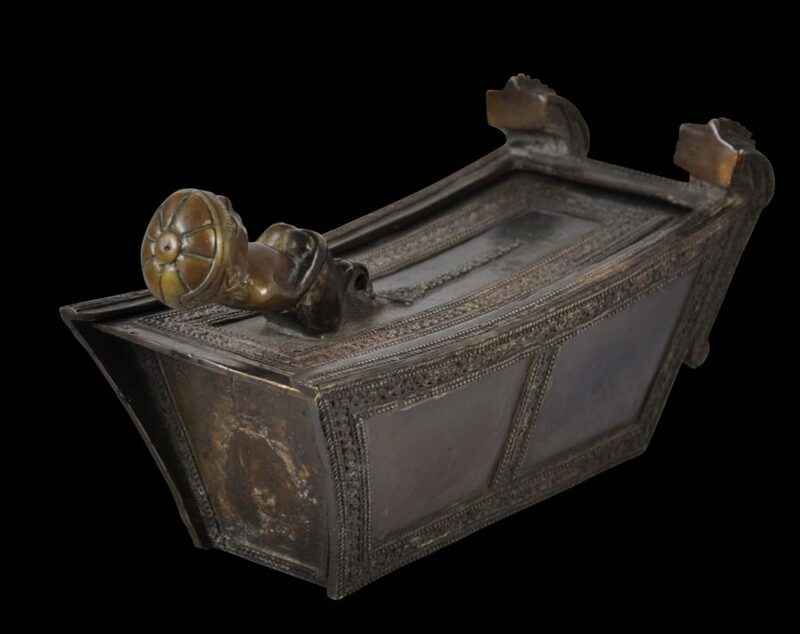 Such boxes were most likely used to store small valuables such as jewellery. 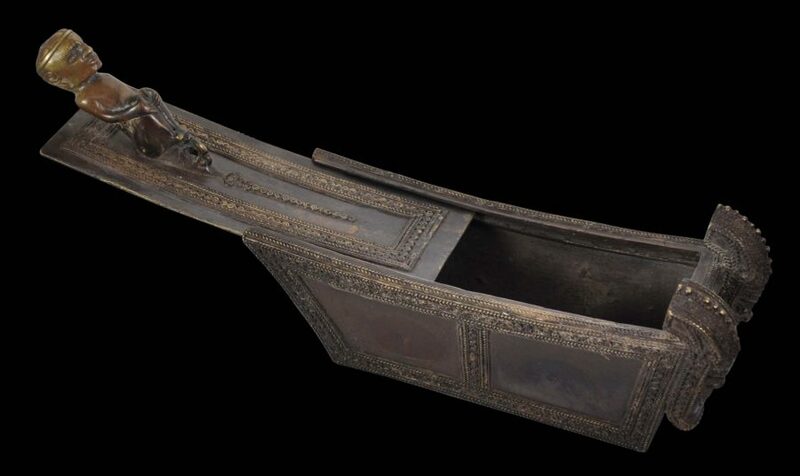 It is in boat form with tapering sides and is based on the much larger carved wooden storage chest of the Bataks, known as a hombung. 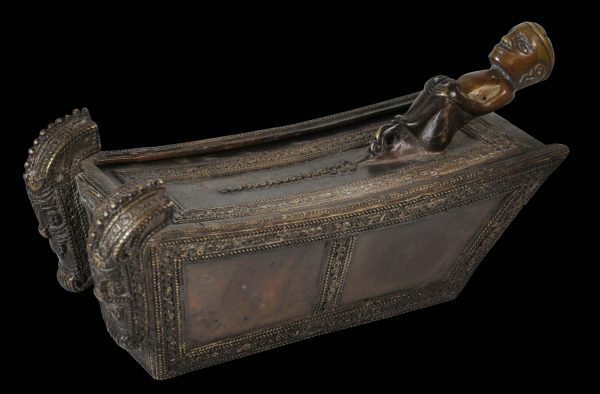 These large chests were used by village headmen to store family heirlooms such as textiles and weapons, and were large enough that they also served as a sleeping platform. Smaller chests in wood the size of the example here are also known – see Sibeth (1991, p. 154) for an example. Each panel of the casket here has been decorated with borders of spirals and ‘plaited’ motifs. 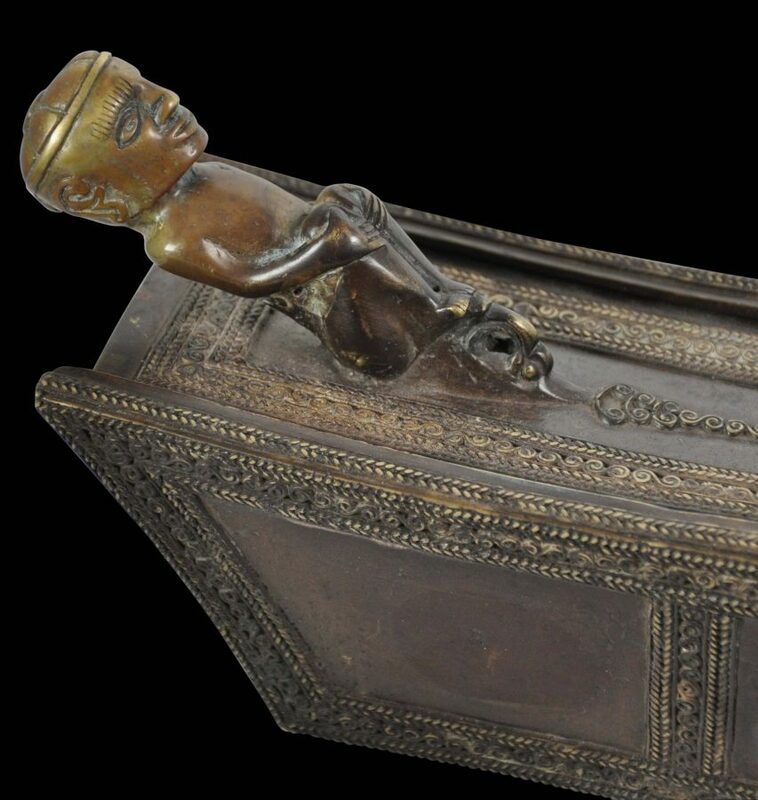 The top slides out, and the pull on the lid is in the form of a male ancestor figure (debata idup) who sits at an angle but in typical form with his hands around his knees, pulling his legs close to his chest. The figure has well-defined features including well-cast ears. He also wears a close fitting segmented cap. The front of the box has been cast with a pair or protective mythical creatures that have both lion (singa) and elephant (gajah) elements. 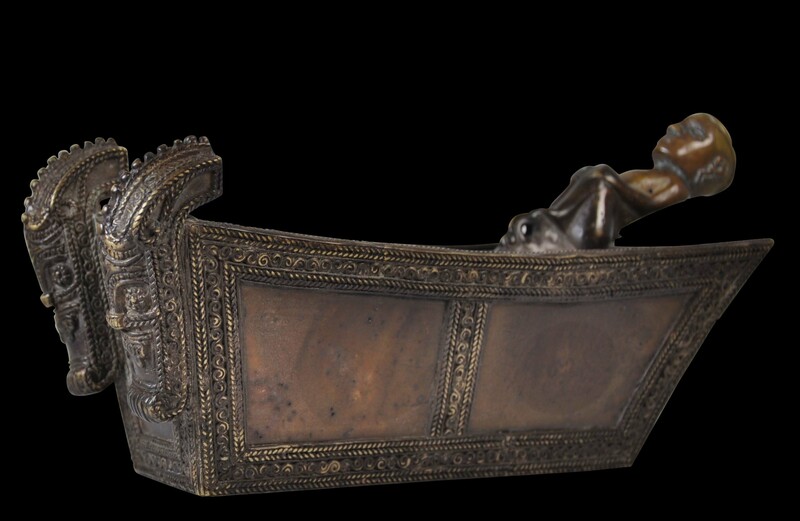 This same from is used in large carved wooden form on Batak houses also for protective reasons. 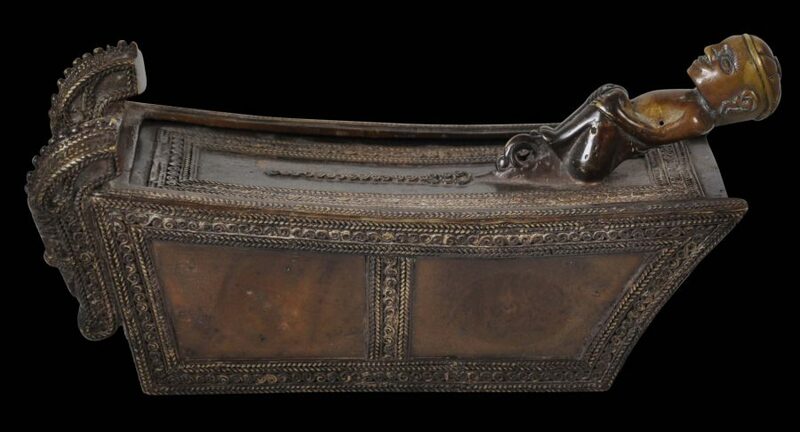 The brass has a brownish hue, darkened from age. The ancestor figure has been worn smooth from handling and has a corresponding yellow tone. Batak jewel caskets in brass are relatively rare. A similar example was sold at Christie’s Amsterdam in its ‘Tribal and Southeast Asian Art’ sale of May 12, 1998, as lot 218. The Batak are an ethnic group whose ancestral land is in northern Sumatra. Today they number around four million and form one of Indonesia’s larger ethnic minorities. The spectacular volcanic Lake Toba (Danau Toba) in north Sumatra is the ancestral home to the largest Batak group, the Toba Batak. The lake is the largest freshwater lake in Indonesia. ter Keurs, P. et al, Au Nord de Sumatra: Les Batak, Musee du Quai Branly, 5 Continents, 2008. 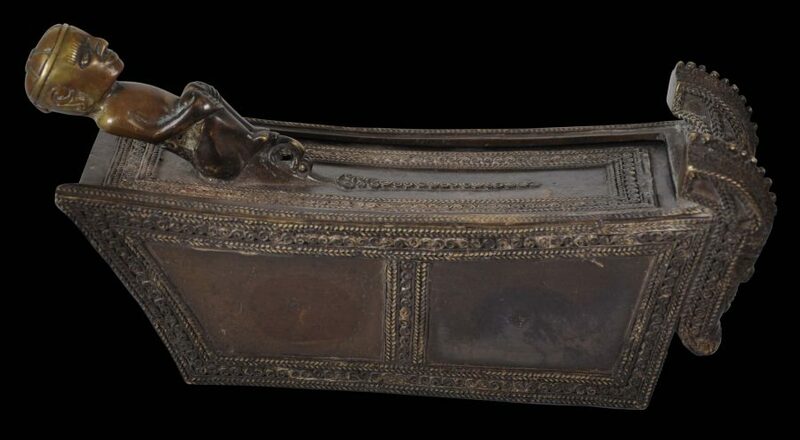 Sibeth, A., Batak: Kunst aus Sumatra, Museum fur Volkerkunde, 2000.